CONTENT WARNING: Discussions of gaslighting, racism, and emotional abuse. SPOILERS for some relationship-related events in Case Closed. I was only a kid when I started watching Case Closed religiously on French TV. It was exciting watching the little detective see right through deception to catch dangerous criminals case after case. He had smarts that I wished I could equal one day and his relationship hijinks made me smile, laugh, and cry. But his life also involves a ton of secrets and lies—and as I’ve learned over the years—lying isn’t how you keep a healthy relationship going. Case Closed by Gosho Aoyama follows the adventures of kid detective Conan Edogawa. Conan may look like a first grader, but he is secretly Shinichi Kudo (Jimmy Kudo), a famous high school detective who was caught by the Black Organization crime syndicate. While the gangsters drugged Shinichi with an experimental poison and left him for dead, it instead shrunk him into the body of a first grader. 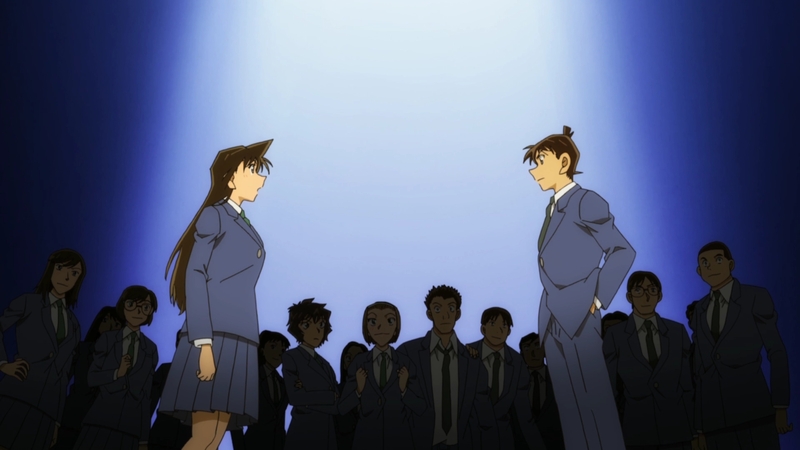 In order to make sure the Black Organization doesn’t retaliate by targeting the people he cares about, Shinichi assumes a new identity as Conan and keeps his true identity a secret to most people, including his childhood friend and love interest Ran Mouri (Rachel Moore), who takes in Conan at her father’s detective agency. For better or worse, Conan acquires a prototype antidote that allows him to temporarily grow back into his original body. And it’s glorious to witness those rare and wholesome moments where Shinichi and Ran get to reunite and share some time together. These interactions become the centerpiece of their relationship. But the antidote wears off after a few hours and Shinichi slips away without saying goodbye to Ran. After abandoning her, someone—usually Conan—comes to tell Ran that Shinichi was called away again for another case. No matter how many times it happens, it’s always heartbreaking to see them afterwards. Shinichi is dying from emotional anguish inside his little body, while Ran is left shocked, angry, and sad. Those were always the moments that made me cry. I first shed tears of support for both of them, but as I grew with the series, those tears started to taste bitter. In hiding his identity from Ran, Conan must constantly lie to her. But Ran is smart and there are multiple moments throughout the series where she suspects Conan is Shinichi. This first happens very early in the series. Conan deduces a person’s occupation by checking their hand, which is something Shinichi would do. She keeps close tabs on Conan, watching him innocently help her father solve a case. Just as she confronts Conan about this, she gets a phone call from Shinichi. Dumbfounded, she looks over at Conan and realizes she was foolish to think they were one and the same. Her hunch, however, was correct and the person who called her wasn’t Shinichi. It was his neighbor and confidant, Professor Hiroshi Agasa (Hershel Agasa) using a voice-changing device he invented to pose as the high school detective. This ongoing issue becomes a game of cat and mouse. Conan’s deception is a fixed point in the overarching plot of the series. Ran can’t ever know, so I feel relief when he succeeds in hiding his real identity every time she gets close to finding him out. At the same time, this ongoing issue becomes frustrating because I just want him to tell her already. This paradox is told in such a compelling way that I want more of it. It’s addictive and it wants to make me believe all of this is normal. Don’t get me wrong: Shinichi isn’t a malicious person. He believes everything he does is for the greater good. His strong moral compass allows him to protect and fight for what he values. He lies to Ran, the person he cares about the most, in an attempt to protect her from the Black Organization. He believes he’s doing right by her. However, because of his lying, Ran becomes a victim of gaslighting. It’s a form of emotional manipulation or abuse that convinces a person that their memories, perceptions, and experiences are wrong. Gaslighters spin facts or outright deny what happened to force doubt on their victims to the point where they question their own sanity. When you grow up with a series where the characters don’t age, the story might not change, but you will. Ran’s experience became disturbingly familiar to me in my teenage years as a Black Muslim man living in a city that used to be the second-largest slave-trading port in France. Similar to how Conan rejected Ran’s perception of reality, my own experience of discrimination wasn’t acknowledged. If you’re a minority, you often have people trying to convince you that your perception of your own reality is wrong. People will tell you that things aren’t as bad as you think they are, that you’re blowing things out of proportion, or that discrimination doesn’t exist. Conan marginalizes Ran by leaving her out of the list of people who know about his real identity. Those who know his secret have used body doubles and recording tricks to keep her from finding out. She was once even sedated to keep her from seeing Shinichi transform back into Conan. They twist facts to deny what happened, convince her that her memories and experiences are wrong, and bring her to the point of doubting her own sanity. I would tell myself Conan does this out of love. He has a secret that could potentially put Ran in danger, so he has to hide it from her. But in reality, keeping secrets to protect someone is a tired and overused trope that needs to be questioned, especially when it can have such a negative impact on someone. One particular moment highlights the nightmare of a relationship Ran and Shinichi share. In episode 193 of the anime (volume 26 of the comics), Conan uses the prototype antidote to go on a date with Ran. Shinichi encounters a murder during the date and goes to investigate, promising Ran that he’ll be back. Wanting to confess his love to her as Shinichi, he tries to solve the case as soon as possible, but the antidote starts to wear off just as he apprehends the culprit. Without enough time to go back to Ran and confess, he comes back as Conan and tells her that Shinichi got an emergency call and had to leave. Heartbreaking doesn’t even begin to describe this moment. Ran not only feels betrayed by Shinichi, she also verbally attacks herself for believing him at all. Conan goes silent at the sight of her breaking down. When he speaks again, he lets his inner emotionally distraught Shinichi shine through to tell her that Shinichi wishes she would wait for him. Conan’s voice breaks when he tries to continue, and the tearful Ran stops him and tells him he doesn’t have to put so much emotion in his voice. This moment is riddled with contradicting emotions and dramatic irony where everyone is hurting. It’s bittersweet, but cute. I couldn’t help but cheer both of them on. But knowing what Conan is doing is gaslighting affects how I watch what is supposed to be a sweet and romantic moment. Being a witness to Ran going through all of those contradictory emotions is very hard for me, considering how close to home her experience of gaslighting is to mine. When all is said and done, no matter the reason, no matter how good of a person you are, and whether it’s conscious or not, emotional abuse is still emotional abuse. Ran is hit hard with Shinichi’s wish for her to wait for as long as it takes. After Conan tells her, she proceeds to stress-eat five bowls of ice cream. Shinichi remains on her mind later, as she always wishes for his return or that he’d be closer by whenever she makes a wish. These situations have brought her to tears and led her to mental breakdowns throughout the series. Looking at her ways of coping with her gaslighting, it becomes clear as day that their relationship isn’t healthy. It’s difficult, however, to put the blame solely on Shinichi, or on Gosho Aoyama, the creator of the series. The trope of deception is so normalized in media that Aoyama likely didn’t even consider it as unhealthy or abusive. And, at the same time, it’s this very fact that makes Case Closed a blueprint for a problematic fave that can get better. When characters (or real people) are survivors of anything that can lead to trauma, media tends to portray them solely as victims. This does a complete disservice to the conversation around mental health, because people are much more than victims of their condition. Since Ran is never portrayed as a victim of gaslighting, the creator avoids portraying her as one and instead gives us one of the most resourceful, three-dimensional characters in the series. She’s a black belt in karate and is rarely the damsel in distress. Some characters, even Conan, would be dead if it wasn’t for her and her quick wit. And not only is she physically strong, she possesses a strong sense of justice and appreciation for human life. The series proves time and again that Shinichi and Ran share the same sense of morals, and while their strong moral character doesn’t excuse the gaslighting, I believe there still is hope for them to address this issue by the end. When Ran eventually learns the truth, she should confront Shinichi about what his secrets and lies did to her psyche. Confronting your gaslighter isn’t always a safe option in the real world, but Case Closed is somewhat unique in that Shinichi isn’t trying to hurt Ran. If the series allows its characters to openly discuss past unhealthy behavior, make amends, and meet each other on equal footing going forward, I believe that they and their relationship could come out of this stronger. Above all, there is hope that both Aoyama and audience members will learn from this series’ mistakes. Recognizing these issues lets us not only start cheering for a genuinely sweet relationship within Case Closed, it also might inform how other works can and should avoid normalizing abusive behavior through these tropes. Assad is a Black Frenchman who grew up watching anime and learned English thanks to Doctor Who. He is now aspiring to be a full-time writer/translator after his English studies. You can find him sporadically posting articles on culture, language, and race on Medium, or you can hang out with him on Twitter @Doctor_Whodunit.